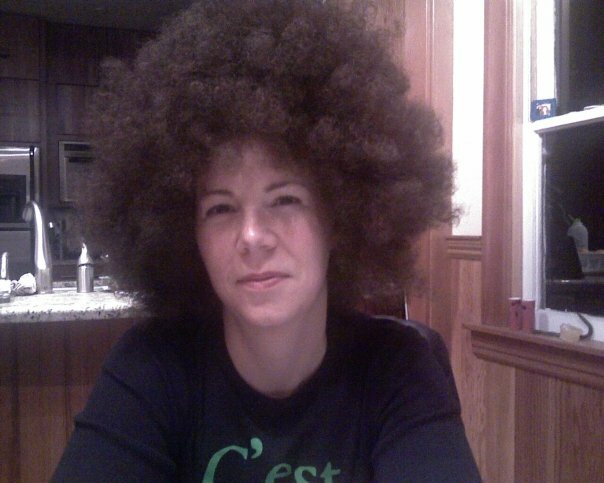 I think I need a headdress. Feathered, painted and beaded. Like the one I’m standing in front of at the Chicago Art Institute – Artist’s Date 42. According to the description, it is meant to express a sense of beauty, while spiritually protecting the wearer, providing potency in battle, diplomacy and/or courtship. I could use that – spiritual protection and potency. Especially in courtship. I feel like I’m fumbling all over the place in this suddenly, or not so suddenly, single world. Perhaps a wig would suffice. Cover up my naked head. My naked heart. I laughed, but he was dead serious, waxing the possibilities of an Uma Thurman Pulp Fiction bob. I showed him a photograph of me wearing a large Foxy Brown afro wig many years ago in Oakland. I told him I wished my hair grew like that. How I longed to wear a wig but worried about offending people – lest those whose hair grows that way think it is a joke, this seriously small white girl sporting a do belonging to someone else. We made a date to go wig shopping but never quite made it. I had forgotten about it until now. And really, I probably shouldn’t be thinking about it now. Or even be here at all. My friend Julie arrives from Detroit in a few hours. Her visit comes on the heels of my friend Ernie’s visit from Seattle, which came on the heels of my trip to Dublin, and precedes my trip to Minneapolis – for my cousin Andrew’s wedding – by just days. And yet, I am here. Stealing away for an hour or so, by myself, with no intention any more noble than to see with different eyes, hear with different ears, feel with a different heart. To leave here a little better than I arrived. To fill my mind with something other than “me, me, me.” It is a relief. My plan was to visit the African Art. But I am stopped in my tracks in the Native American section. Thinking about wigs. About my cousin. About my other cousin – Diane. I visited her in Albuquerque when I was 17. The trip, my first time traveling alone – to see Diane in New Mexico and Andrew in Los Angeles – was a high-school graduation gift from my parents. I bought suede fringed boots, the kind with no hard sole, on that trip. They snaked up my legs, stopping just beneath my knees and tied with crisscrossing leather cord. Burnout style. And also, a wooden box, the top decorated with a sand painting of Father Sky – it says so in pencil, written on the underside, good for storing treasures. Diane bought me a miniature wedding vase, a smaller version of the kind I would drink from at my own wedding 15 years later. It seems like forever ago. As does my trip to see Diane. Except the memories of my marriage feel sneakier – unexpected – and not as purely sweet as those of my trip to New Mexico. So I keep on moving, rather than sitting (or like my friend Sheila likes to say “bathing”) in the feelings. 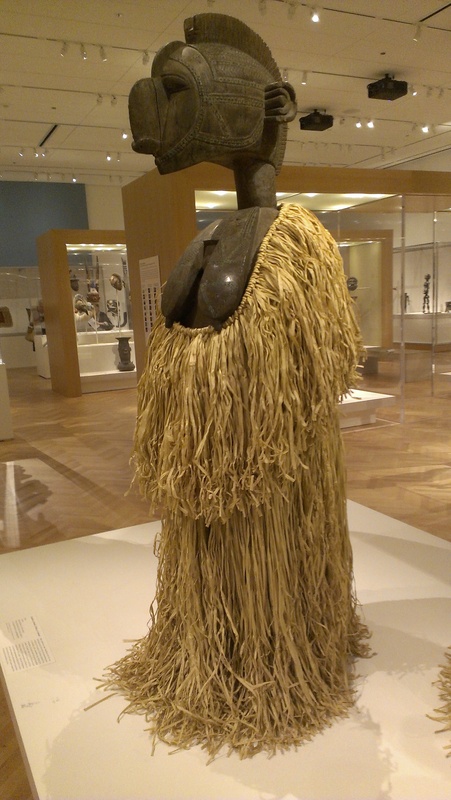 I look at pipes, teepee covers and silver jewelry, eventually moving on to the African Art section – something without connection to the past. Something entirely my own. Sort of. Unless you consider it is my ex who bought me a gift certificate to the Old Town School of Music and Dance, where I study West African dance. Or that I found myself in Rwanda right in the middle of our divorce. And yet, Africa is mine. It always was. A dream since I was a child. He just helped get me there. A few voluminous robes – the kind I have seen my instructor Idy dance in, constantly moving the sleeves in gorgeous gestures to keep from getting the fabric caught up in his feet. A couple of headdresses and costumes, one depicting the ideal mature woman in the 17th century – prominent nose, jutting chin, and large breasts. I think of my own breasts. Small. No longer pendulous. Faded scars run from breast fold to areola – subtle reminders of my reduction surgery. A different beauty ideal. I am struck by the words tacked to the wall. 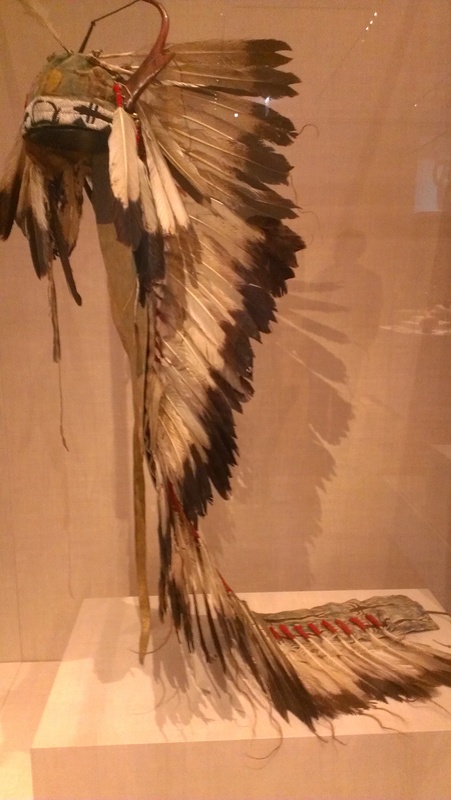 I think about the Native American headdress. Of my own dress. My friend Tori says I dress differently since my divorce. Sexier. It was not my intention, but I believe she is right. Across the room is a timeline of events, highlighting key moments in both African and world history. I snap photographs so I can remember them. 1884: European nations meet for the Berlin West Africa Conference, initiating the European scramble to colonize Africa. By 1900 only Ethiopia and Liberia remain independent. 1957: The nation of Ghana gains independence from British colonial rule, launching a continent-side decolonization movement. 1980: Zimbabwe gains independence from Great Britain; it is the last European colony to do so. 1990-94: Civil war in Rwanda leads to genocide. I remember my friend Geri’s map-of-the-world shower curtain – so old, Rhodesia was still on it. I think about my own map. My timeline. My dress. My independence. Messy. Uncertain. Liberating. But unlike Rhodesia, I got to keep my name.